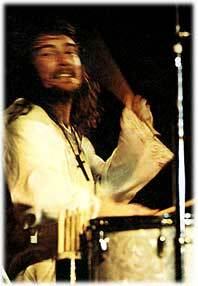 from sptimes.com January 16, 2003 : "Bill Ward, Black Sabbath's legendary drummer, 54, recently released Straws, a solo tune available only by download from his Web site, www.billward.com.
. . . "I'm not sure what a pacifist is," Ward says. "I'm nonviolent at all costs, but at the same time, I'm a human being. I know that people get angry. I've done that in my lifetime. I don't find fault with that. I think it's a natural human instinct. I know these things happen. There's not much I can do about that except take care of myself and my family as best I can."
. . . A vegetarian for the past 14 years, Ward is no longer the hard-living heavy metal drummer, boozing and drugging with bandmate Ozzy Osbourne.